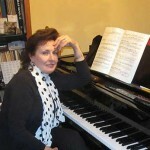 Regina Kutnovsky began her piano career from a very young age. She was ten years old when she made her first public television appearance where she played the complete Mozart Sonatas. She attended and graduated from the Gnessin Russian Academy of Music in Moscow, in 1975 where she received her Master’s degree in teaching and performance. In 1979 Regina immigrated to Israel and began teaching at the Rubin Academy, as well as continued to perform both live and on radio broadcasts. After her move to Johannesburg, South Africa in 1985, she held the position of Senior Lecturer at the University of the Witwatersrand. She taught and mentored many talented students, one of whom participated in an international competition in Pretoria in 1990. In addition to her position at the university, she was also appointed by the Unisa University of Pretoria as piano adjudicator. Regina continued to perform both locally in the Great Hall of Witwatersrand, and internationally and received many awards for various competitions. Regina is currently working in her private studio in Toronto, Canada where she teaches and prepares students for RCM exams and performance licenses.